An amazing and unique vocalist with the excitement of Darin, the vocal power of Bennett, and the swinging sensibility of Sinatra. A first class singer/songwriter, Tony B always presents a high-energy show featuring past classics to modern day gems, like those performed by artists Peter Cincotti, John Pizzarelli, and Michael Buble'. Tony has appeared at the Showboat Casino Hotel, Trump Taj Mahal, Bally's Grand, The Sands, and The Tropicana, where he recently appeared in the Stars & Stripes Revue. In addition to being an acclaimed Around with Tony singer/entertainer, Tony is also a composer. The title track of his debut CD "Swingin' B", was featured in the movie "THE CREW" (Touchstone), as well as on "THE CREW" CD Soundtrack (Milan Records / BMG). 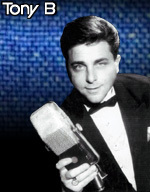 Radio Hall of Fame talk show host Joey Reynolds of WOR radio (NY) said, "Tony B is as exciting as Bobby Darin was when he first burst upon the scene." A native New Yorker, Tony started singing at a very young age after being whacked by Bobby Darin's recording of Mack the Knife. His musical idols include Darin, Frank Sinatra, Tony Bennett, Paul McCartney, and Al Jolson. In January of 2002, Tony's recording of "I've Got The World On A String" was selected by the family of composer Harold Arlen (Over The Rainbow, Come Rain or Come Shine etc...), to represent that song in their catalogue at HaroldArlen.com. Tony's "World On A String" is the featured song on the Arlen website, and is the 1st track on "Harold Arlen Now", the official promotional Harold Arlen CD, featuring Faith Hill, Tony Bennett, Natalie Cole, B.B. King and Eric Clapton.